Want to get people sharing, grow your fans, make money, or know your readers better? Get Shareaholic now! Welcome to Shareaholic’s Browser Share Report. Since the beginning of the calendar year, we’ve been tracking the different browsers people — 250 million of ’em — use when they visit our network of 200,000 publishers. If you’re a site owner, you’ll want to pay close attention. It’s worth knowing which browsers are more commonly used so you can optimize your website to be compatible with those browsers. This way, your visitors can have an exceptional experience every time they drop by, regardless of whether they’re using Chrome, Firefox or Safari. In this report, you’ll see which browsers are most popular and whether or not their usage has grown or declined. What are the three biggest takeaways? 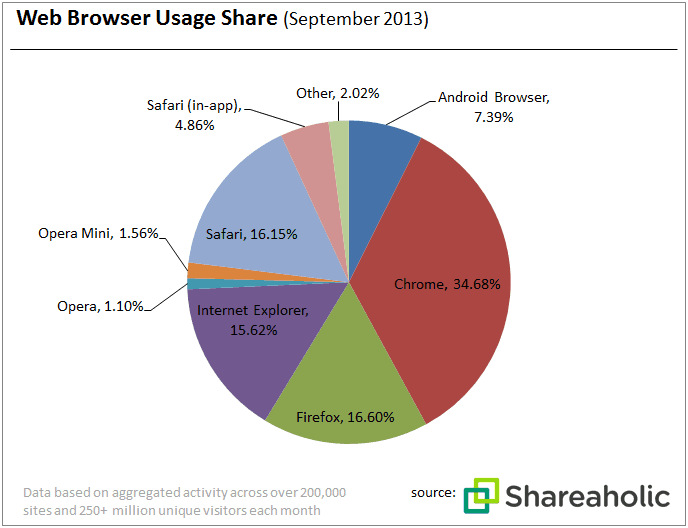 1) The top 4 browsers are used by more than 80% of the market. Last month, Google’s Chrome web browser still held the #1 spot, capturing more than a third of the market with a 34.68% market share, which was also more than double Firefox’s market share (16.60%). Firefox came in 2nd place, followed by Safari and Internet Explorer used by 16.15% and 15.62% of the market, respectively. 2) Only the stock Android browser and Chrome experienced double-digit growth. Of the 8 browsers we tracked, Android grew the fastest (growing 26.75% from January until September), followed by Chrome which continues to solidfy it’s market leader position (growing 15.64% in the same time period). 3) Half of the browsers we tracked were in decline. Internet Explorer was hit the hardest; in the last nine months IE saw its market share shrink 23.81%. Opera was next in line, losing 16.65% of its market share. 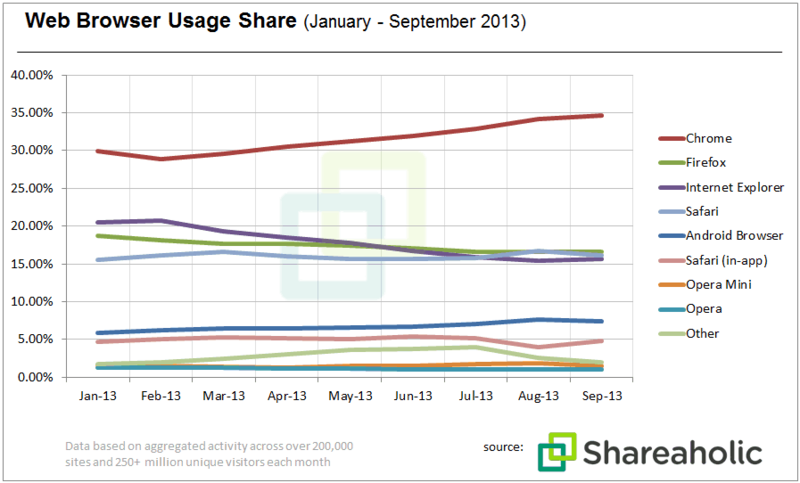 Firefox experienced a 11.6% decline in usage and Opera Mini (Opera’s mobile browser) saw their market share drop 6.23%. It will be interesting to see how these numbers play out in the next few months. As smartphones become cheaper and more accessible, we’ll likely see further growth among mobile browsers, perhaps in Android usage moreso than Safari. Maybe the new Chromebook might catch on too. Oh, the possibilities. Which browsers are your visitors using? Let us know in the comments! For the latest update to this and other Shareaholic Reports, review our more recent releases. Want to know more? Email press@shareaholic.com.